What are the Gaza border riots really about? Ask the Palestinian rioters and this is what they say. The world thinks that the Palestinians rioting on Israel’s border with Gaza in the so-called March of Return seek freedom and a better life. But footage taken during a riot this week exposes the Palestinians’ real goal in these violent incidents. Freedom? Development of Gaza? No! Israel destruction! CLICK HERE to view the truth. In a tweet, defense minister hints to leaders of Gaza terror group that Israel is ready to go to war over border violence. 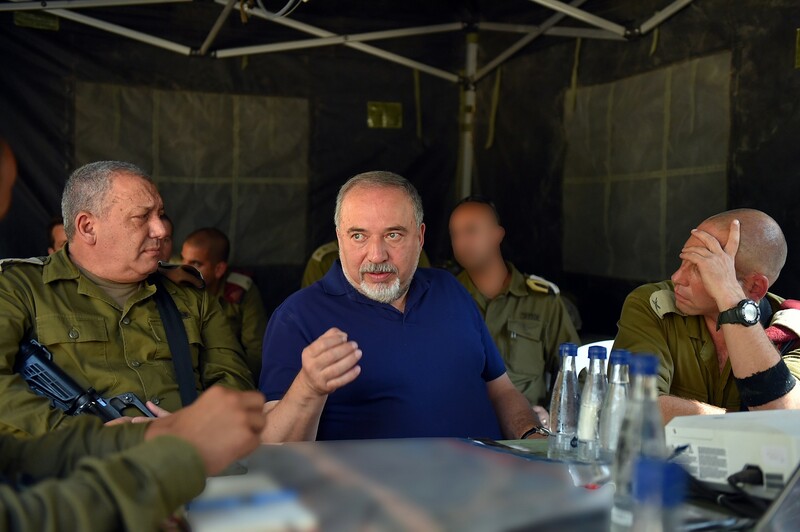 Defense Minister Avigdor Liberman on Friday signaled to the heads of the Gaza-based Hamas terror group that Israel was prepared to go war, as the military geared up for another day of violence along the security fence surrounding the coastal enclave. In a tweet, Liberman indicated that Israel had been holding back on a harsh response to the near-nightly riots on the border in order to prevent an all-out conflict during the period of the Jewish High Holidays, beginning with Rosh Hashanah on September 9 and ending with Simchat Torah on October 1. “We’ve been through the High Holidays exactly as we planned, without a flare-up and by exacting a heavy price on the rioters along the Gaza border,” Liberman said, referring to the people killed and injured by IDF troops during the clashes. “The holidays are over, and I say to the heads of Hamas: ‘Take that into account,’” the defense minister wrote. WASHINGTON — The Trump administration is giving greater priority to Iran and radical groups it backs in a new U.S. counterterrorism strategy document released on Thursday that further increases the pressure from Washington on Tehran. But the current document shows how the Trump administration has put Shi’ite Muslim Iran at the center of U.S. concerns, even as it keeps a focus on Sunni Muslim militant groups in Syria and Iraq. by AP and World Israel News Staff for WorldIsraelNews.com, October 05, 2018As Gaza plight worsens, Palestinian leader continues to tighten the screws on the coastal enclave’s residents. Abbas instead has implemented a variety of crippling sanctions on Gaza to pressure Hamas to relinquish control of the strip, which the terror group has ruled since it ran Abbas’ Fatah faction out of Gaza in a bloody coup in 2007. Netanyahu’s comments on Thursday were made during German Chancellor Angel Merkel’s visit and were largely in response to Abbas’ threats at the UN General Assembly last week to “give up responsibility” for Gaza if Hamas backs out of the reconciliation Egypt is attempting to broker. “We are putting an end to the lie of the ‘Palestinian refugee problem’ and the attempts at creating a false sovereignty within a sovereignty,” says Mayor Nir Barkat. The city of Jerusalem will evict the United Nations Relief Works Agency (UNRWA) in light of the organization’s illegal activities and incitement of Palestinians against Israel, according to Mayor Nir Barkat on Thursday. In a statement, Barkat said the new U.S. policy cutting $300 million to the controversial organization inspired the move, which will see unlicensed UNRWA-run schools, medical centers and sports facilities transferred to Israeli authorities. Qatar Foundation official Haya Al-Nassr, director of communications, awards Hamas leader Ismail Haniyeh (left) with a “victory shield” featuring the Dome of the Rock in Jerusalem. Credit: Middle East Forum. (October 5, 2018 / JNS) For seven years, the Qatari government has been spending $8 million to influence content in classrooms across the United States, including in the heavily Jewish-populated town of Newton, Mass., according to The Wall Street Journal. Does Trump’s Tough Talk on Iran Have a Next Step? One of the value propositions of a Trump presidency is that the chief executive and his various helpers will say exactly what’s on their minds, regardless of how impolitic or contradictory or flat-out nonsensical their thoughts might be. So it was at United Against Nuclear Iran’s third-annual summit last week, where several of the country’s top foreign policy officials seemed to hold nothing back in discussing the Iranian threat.